We called it. When we first heard of Sphinx Development‘s plans for a townhome community just west of Corinth and south of Cedar Creek, we had a feeling it would sell out quickly. There’s a dearth of new construction in the $200,000 range, and plenty of opportunities for infill just east of North Oak Cliff. So we’re not surprised in the least to hear that all 49 units of the development’s initial phases have been snatched off the market. 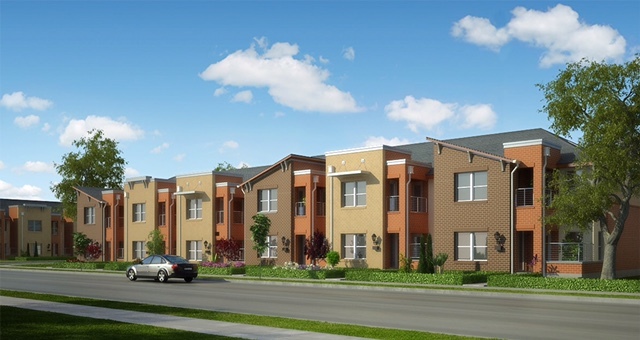 The Fiji Townhomes development, marketed by Virginia Cook Realtor Angela Downes, will soon launch a third phase that will include lofts and retail, as well as office space. According to Sphinx, Phase Three will be ready for occupancy in 2018.